Appirits, the Japanese game developer and publisher recently has released a unique play mode namely Pandemonium for their free-to-play browser-based card & simulation game Shikihime Garden since July 1st 2014. Shikihime Garden may be seen as a RPG Farmville edition made by Japanese combined with traditional card combat gameplay. The game requires players to battle against numerous enemies to collect new cards (called Shikihime, i.e. girls using magic) and items which later can be used as decorations in their small but cute gardens. The good mix of card-based gameplay and simulation factors is what makes Shikihime Garden outstanding from other card games. By introducing the brand new Pandemonium mode, Appirits now put players’ gardens under numberless attacks from hordes of monsters and evil spirits. Players will select Shikihime cards to a special deck to fight against those fierce enemies. 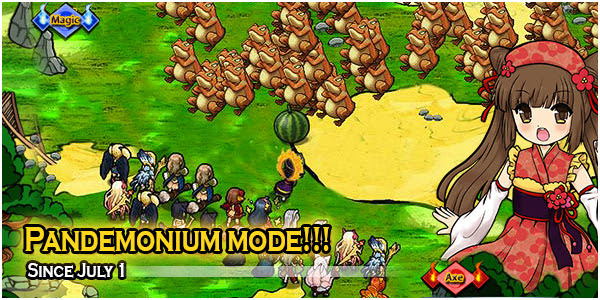 Pandemonium mode will force players to overcome several waves of attacks to protect their peaceful gardens. For each wave, players need to select a Shikihime card for the role of a leader who will determine Attack power of the whole deck. In addition, to raise higher chance of winning, players can throw garden objects or ornaments at the enemies to lower their HP. However, if players fail to fight back enemies in Pandemonium mode, their farm fields will be ravaged! Farming is another update that Appirits has implemented into the game recently. By planting seeds on the fields, players can harvest various rare and valuable items for Shikihime or ornaments for decorating their gardens. The mechanics of farming in Shikihime Garden is similar to that of popular simulation Facebook games but rather simplified.